Centaurea cyanus in a wheat field. English : Centaurea cyanus in a wheat field. A Topmouth gudgeon (Pseudorasbora parva), Collected from Hamamatsu, Shizuoka, Japan and later photographed in an aquarium. English : A Topmouth gudgeon (Pseudorasbora parva), Collected from Hamamatsu, Shizuoka, Japan and later photographed in an aquarium. An animated GIF of the evolution of Canada's internal borders, from the formation of the dominion to the present. 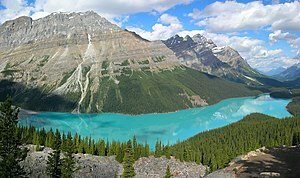 English : An animated GIF of the evolution of Canada's internal borders, from the formation of the dominion to the present. Austrian Forward Rubin Okotie tries to score on Congo Goalkeeper Destin Onka at the 2007 FIFA U-20 World Cup. Onka makes the save. Shot at Commonwealth Stadium, Edmonton, Alberta, Canada. English : Austrian Forward Rubin Okotie tries to score on Congo Goalkeeper Destin Onka at the 2007 FIFA U-20 World Cup. Onka makes the save. Shot at Commonwealth Stadium, Edmonton, Alberta, Canada. English : The ghost town of Bodie, California. English : Honeycomb of Western honey bees (Apis mellifera) with eggs and larvae. 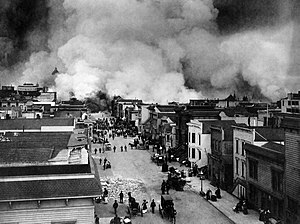 English : San Francisco Mission District burning in the aftermath of the San Francisco Earthquake of 1906. An Osprey preparing to dive. Photographed at Kennedy Space Center. English : An Osprey preparing to dive. Photographed at Kennedy Space Center. English : Ribnica lake, Slovenia. Dry earth in the Sonoran Desert, Mexico. English : Dry earth in the Sonoran Desert, Mexico. Korean Fir (Abies koreana) cones. English : Korean Fir (Abies koreana) cones. An Andean man in traditional dress. Pisac, Peru. English : An Andean man in traditional dress. Pisac, Peru. Diagram of a human female skeleton. English : Diagram of a human female skeleton. English : Detail of the National Grand Theatre in Beijing, China. Transition from glass to titanium portion of roof. 1942 photograph of a carpenter at work, as a historic example of early color photography. 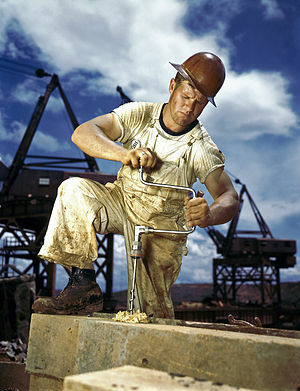 English : 1942 photograph of a carpenter at work, as a historic example of early color photography.